It could easily be argued that signing three strikers would still not be recompense enough for Liverpool, after goal-greedy Luis Suarez shipped out to join Barcelona in a mega-bucks £75m deal. Still, attempt to fill Suarez’s boots they must and according to Ladbrokes at least, Wilfried Bony could yet be a candidate to jump into the chasm left by the Uruguyan at Anfield. 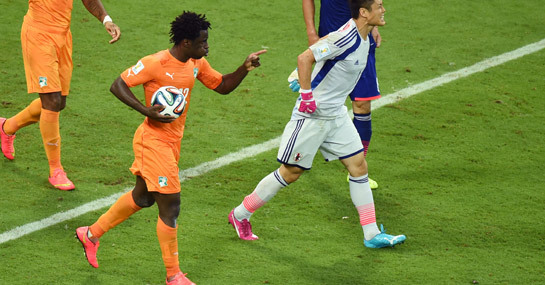 The firm place Liverpool as 6/5 shots to land Bony this summer, who scored 25 goals in all competitions for the Welsh club during his debut campaign, before finding the net twice for Ivory Coast at the World Cup. However, given his prolific return in his first season it’s only natural Swansea wish to keep hold of the gem that they signed from Vitesse Arnhem, a fraction over 12 months ago. Garry Monk knows how pivotal keeping a striker of such quality will be to his bid for survival at the Liberty Stadium this season, and as such the club have thus far stood resolute in their stance that Bony is not for sale. Swansea are currently 5/1 to go down, but given they are the 4/6 favourites to retain Bony’s services in for the impending campaign then those odds are arguably quite tasty. It’s thought Swansea had balked at a bid in the region of £20m from Liverpool a few weeks back and now the Premier League runners-up are flusher than the Wolf of Wall Street, it could be they come back with an offer too good to refuse. The Swans are reportedly hanging on for at least £25m for their man, and this is a figure which is likely to rule out 10/1 shots Everton and possibly even 5/1 chances to sign Bony, Tottenham. Arsenal are also 10/1 pokes to capture the Ivorian, though Alexis Sanchez’ big money move from Barca casts further doubt over any potential deal.